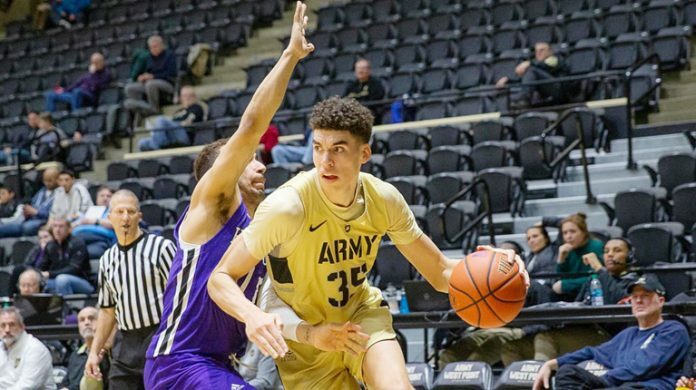 The Army West Point men’s basketball team was unable to halt a second-half surge by Lehigh and ultimately fell on Saturday afternoon. WEST POINT – The Army West Point men’s basketball team was unable to halt a second-half surge by Lehigh and ultimately fell, 75-70, on Saturday afternoon in a Patriot League contest at Christl Arena. The Black Knights (11-12, 6-4 Patriot League) had a lead entering the second stanza, but the Mountain Hawks’ (15-6, 8-2 Patriot League) hot-shooting offense came to life and sparked the comeback effort. Alex King paced the Cadets offensively with a team-best 18 points on 7-of-10 shooting. John Emezie and Lonnie Grayson each finished the afternoon with 11 points apiece, while Matt Wilson and Jordan Fox added nine and eight points, respectively. Army controlled the pace of the game from the start, utilizing their up-tempo offense to get down the court quickly and generate quality looks. Lehigh opened the scoring with a 3-pointer, but the Black Knights went on the attack shortly after with a 14-5 run. Army began to build on its advantage and back-to-back layups by Wilson sparked a 15-2 run that put the Cadets ahead by 19, 34-15. Despite six unanswered points by the Mountain Hawks to close out the half, the Black Knights carried a 41-28 lead into the break. Army shot over 50 percent from the field in the opening stanza with King, Grayson and Fox combining for 27 points. The defensive effort put forth by the Black Knights stood out as well, as Army held Lehigh, one of the best all-around shooting teams in the nation, to just 28 points on 10-of-30 shooting. Army maintained its double-digit advantage for the early portion of the new half as Emezie scored eight points in the first four minutes. However, Lehigh began to heat up and look like it has in games past. With 14:21 left in the contest, the Mountain Hawks went on a 23-5 run after knocking down four triples and going 8-of-9 from the field over a six-minute stretch to even the score at 58-58. The two sides began to trade baskets and a Wilson layup 1:41 remaining put Army ahead 70-68. Lehigh was quick to respond though and countered immediately with a 3-pointer to retake the lead. Over the final 1:40 of the game, the Cadets could not find the bottom of the basket and the Mountain Hawks were able to close out the contest at the foul line for the 75-70 win.